Scroll down for our latest PRESS RELEASE! Please email publications to update our listing to info(at)toptotop.org. Thank you! Looking for older press? – Check this archive! Family being on a 17-years-expedition sails from the ARCTIC over NEW YORK and continous to Bermuda, the Azores, Ireland, Iceland and Greenland! 2017, they sail around the North Atlantic to the Arctic and back to New York. They expect to be back in New York end of October to report about their findings, before heading towards Antarctica. In each destination they hope to report to as many students as possible what they have learned on their 17-years ongoing expedition and their optimism regarding our planet’s future. They sail off New York circumnavigating the North Atlantic back into the Arctic collecting more climate data. They try to scale the tallest mountain in the Arctic and will be back in New York end of the year to report to the Explorers Club and the New York Yacht Club, before heading to Antarctica. The mission of the TOPtoTOP Global Climate Expedition is to inspire youth with top solutions and the beauty of nature to save our planet. The expedition started 16 years ago by the Schwoerer family, who have circumnavigated the planet and travelled to every climate zone, documenting examples of climate change and its effects as well as solutions. 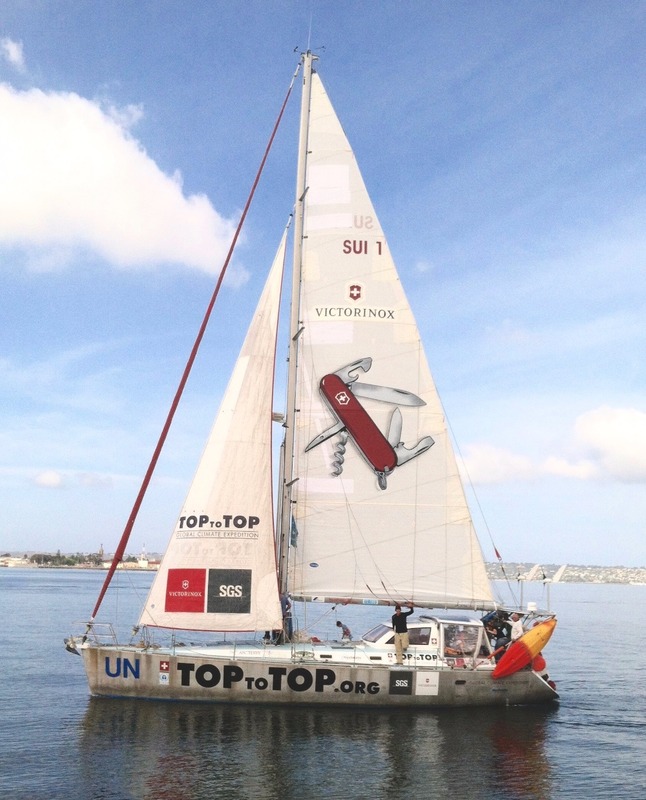 Led by Dario, an accomplished Swiss mountain guide and climatologist, and his wife Sabine, a mountain climber and registered nurse, TOPtoTOP was incorporated in 1999 with a goal of being the first climate expedition to traverse the seven seas and summit the highest peaks on each of the seven continents. Relying on nature and human power, the couple and their five children (ages 1 to 11 years old), are dedicating their lives to the exploration, inspiration and action of creating a positive future for our planet. All their children were born on the expedition and a Victorinox Swiss Army Knife was used to cut the umbilical cord. They seek to bring awareness of environmental issues, especially climate change, to promote the search for environmentally compatible solutions and to encourage the start of projects beneficial to our climate and the environment. Their expedition demonstrates that great achievements can be done in harmony with nature. In August-September 2016, the expedition opened a new route through the Arctic: The expedition-sailboat Pachamama became the 1st boat transitting the Northwest Passage via Fury&Hecla – into Hudson Strait. See short film here about their epic journey! Family members bring their experience as witnesses of the changes. The family members bring stories and images of the people they have met and the condition of nature in a new and meaningful way. Through engagement in school and university programs, they are inspiring the use of clean energy and sustainable living. On the way to New York, the family has been doing presentations in the Boston area, at The Massachusetts Institute of Technology, The Museum of Science, the New England Aquarium, the University of Massachusetts-Boston and the Mystic Aquarium. To date, the Expedition has travelled the 7 seas and its members have climbed the highest mountain on 6 of the 7 continents – using only nature’s force (solar, wind) and human power (sailing, cycling, climbing). They have sailed 100,000 nautical miles, climbed more than 400,000 vertical meters, cycled more than 12,000 miles and visited more than 100,000 students! The expedition sailboat “Pachamama” became THE example in the sailing world what is possible with renewable technologies. At the moment they try to get hold of Tesla founder Elon Mask to partner and start a revolution in the sailing world to go electric with the idea to recuperate power while sailing. From NY they sail to Greenland to support local schools with school material. They hope to include Greenland students in their network of schools that is based on understanding and solidarity. This network of hope between the many schools they have visited, might be the best tool to solve the global challenges we face today.